Fully utilise your 3D CAD data with the Creo NC and Tooling Extensions and leverage the mold, tools and die design features. Decrease errors and save time to market, through efficient tool design and manufacturing. Creo Progressive Die- Takes users through all stages of tooling development for progressive dies. 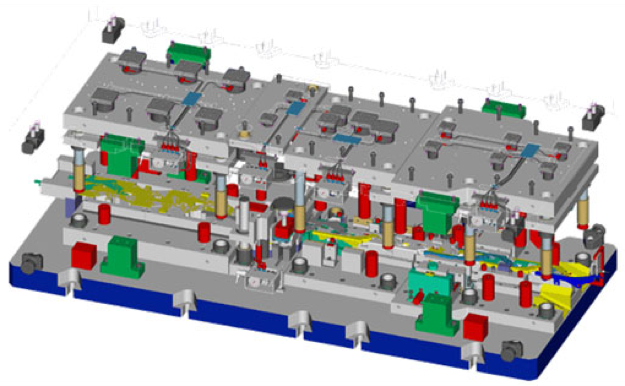 Creo Expert Moldbase- Utilise all the benefits of 3D, when designing moldbases, while still operating with a 2D CAD approach. Creo NC Sheetmetal- Enhance your tooling manufacturing, by removing inefficient sheetmetal manufacturing. Creo Prismatic and Multi-Surface Milling- Virtual milling solutions for prismatic machining, to increase NC productivity and design processes. Creo Production Machining- Enjoy enhanced capabilities for direct cutting and product part shaping, with seamless compatibility with design. Creo Complete Machining- Complete range of programmes for CNC machines in production environments to improve both tool design and manufacturing processes. Creo Complete Mold Design- A comprehensive package for specialised mold creation. Includes core, cavity and moldbase. Creo Computer-Aided Verification- Provides digital inspections of parts and assemblies for total quality assurance. Creo Tool Design- Designed to make even complex tooling more simple, with a process-driven workflow to take users through each stage.